Brain development is impaired in taurine deficient animals, showing neuronal delayed maturation and migration. To get insight in the mechanism of this requirement, our studies examined the effect of taurine deficiency in stem/progenitor cells (collectively named neural precursor cells, NPCs). NPCs obtained from mesencephalon of mice embryos (E13.5 days), the subventricular zone of adult mice or human fetal brain, were cultured in media containing EGF and bFGF, and grown as neurospheres. NPCs become taurine-deficient after few days in culture. Addition of taurine replenished the cell pool by a taurine transporter, functionally expressed in NPCs. Taurine-containing cultures contain higher number of cells, due to increased proliferation, evaluated by BrdU incorporation and flow cytometry DNA analysis. Taurine effects are not immediate, requiring a long time interaction with cells. Taurine is not present in cell nuclei, discarding a direct action on nuclear elements. Taurine containing cultures show a higher number of cells with more efficient mitochondrial potential, as detected by flow cytometry assays using rhodamine123/NAO and JC1. A microarray analysis revealed that taurine regulates NPC genes implicated in proliferation, survival, adhesion and mitochondrial functioning. NPCs cultured in medium with bovine fetal serum differentiate into astrocytes, neurons and oligodendrocytes. 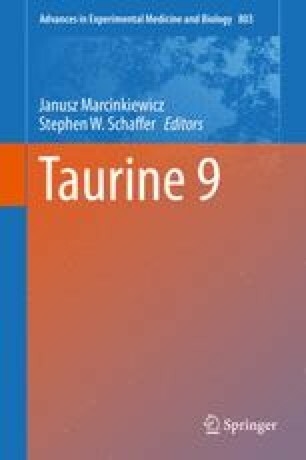 A markedly high number of neurons were found in taurine cultures from NPCs from adult murine brain (229 %) and human fetal brain (307 %). This effect may also be a consequence of a better mitochondrial functioning as neuronal survival in cultures is markedly affected by the energy state of the cell during the differentiation phase. This work was supported by the grant PAPIIT-IN202313 from the Dirección General de Asuntos del Personal Académico (DGAPA).